Historical fiction is a genre I am most interested to read but have a fear that I might put it down. 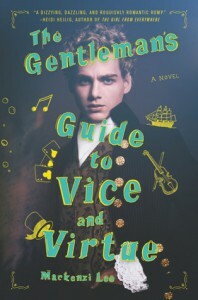 One week ago, I have heard a lot of good reviews and opinions about The Gentleman's Guide to Vice and Virtue and with an upcoming book discussion and Skype with Mackenzi Lee. Here's some thing I have to be honest about - I would never pick up a book with a book cover that features a real person. I admit I was skeptical at first but after a while, just trusting my intuitive I give it a go and read it. I have no regrets in the end. Set in a 18th century period, The Gentleman's Guide to Vice and Virtue begins with Henry 'Monty' Montague, a care less, young drunk charmer who happens to be a born gentleman from a high-class family waking up next to his best friend Percy, one day before their Grand Tour around Europe. Tagging along is Henry's sister Felicity, who is on her way to a boarding school. Every thing was thought as plan by Henry's father, only that it goes very wrong because of Monty's behavior that leads to (surprise) an unexpected turn of events filled with adventure, mystery, conspiracy, a little bit of science and of course, romance. For a young adult book, its a fun read. What is more surprising is that its so light and easy, its enjoyable in many ways. While its pretty straight forward, its the combination of all that makes this relaxing that doesn't need much deep thought but just sit back, rest and drink your preferred tea (or coffee). I would recommend this without a doubt for anyone who wants light reading or a historical buff but in a young adult manner. I can't say much as it will spoil a whole lot more but this is a book, despite how people say never judge a book by its cover, should pick it up and read it.